For a brief period of time, philosophers and learned scientists thought that the defining characteristic that separated humans from animals was the ability to count. This turned out to be a flawed bit of induction – derivation of an absolute from a small sample – and it didn’t take long to find various avian and primate species that could count. Nevertheless, we humans are the top counters on the planet and it has given us the unique ability to measure things, and once we started doing that, we never stopped. It is safe to say that we are obsessed with measurement. We know the tallest, smallest, heaviest, lightest, fastest, slowest, thickest, thinnest, quickest, slowest, widest, deepest, furthest, nearest, flattest, roundest, smoothest, roughest, softest, hardest, loudest, quietest, nicest, meanest, highest, lowest, hottest, coldest, prettiest, ugliest, smelliest, grossest, serenest, tiniest, furriest, of pretty much everything in the known universe. During the third year of Brightworks, we studied Measurement in three forms we humans express it: through Rulers, Clocks, and Mirrors. 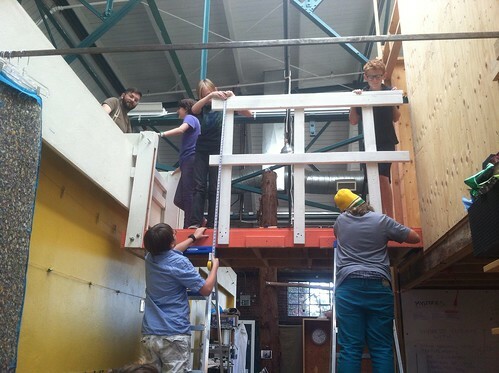 In the 2013/2014 school year, Brightworks explored the human impulse to measure and compare things. Based on the previous two years of Arc experiments, we made an adjustment to the timing of the year and tried a short seven week arc followed by two fourteen week arcs. For incoming students, the first arc of the year is their introduction to the school, and for returning students it is a time to recalibrate, realign, and re-engage – because of this, the first arc was designed to quickly build and integrate our sense of community. The winter arc that follows is when we see some of our best engaged work here, so that arc took us deeper into the conceptual and abstract. In a similar way, the Spring arc is designed to take advantage of the light and irrepressible energy that builds up in the school as the world turns green again. In the fall, we looked at RULERS, protractors (the curvilinear cousin of the ruler), and a tiny fraction of the myriad measurement tools that have been invented over the ages. We measured that which is physical, seen, and heard, and all that which can be quantified; and what we could not directly measure, we calculated and estimated. Accuracy was our watchword, and we enthusiastically ferreted out our sources of error. Bands got to know each other and took on projects that would define the rest of their years with big ideas like building a bridge to connect two spaces and building and designing several iterations of chairs. We turned our attention to ticking, humble CLOCKS, quiet dictators of our modern lives. From the simple leaky urn of the dripping water clock to the common alarm clock with its gears, catchments, shafts, and miserly and metered consumption of potential energy. Having poked around in the clocks innards we looked out at the world, compressing days to seconds with time-lapse photography and subdividing the second into fractions to capture the fleetingly instantaneous with high-speed photography, and because time is relative, we came to see it as elastic and subjective. 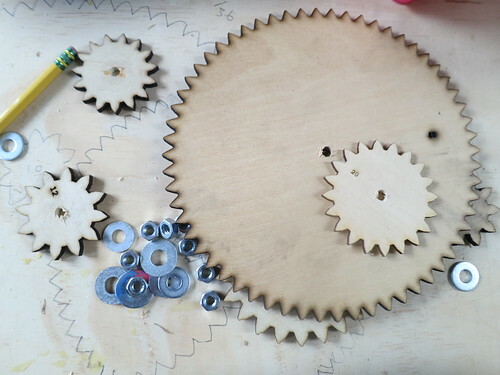 With their collaborators, Brightworks students discovered both ancient and modern ways of keeping track of time, dove into thought experiments about Einstein’s theory of relativity, looked at physical clocks and how they work, and learned about gear ratios and to read an analog clock. 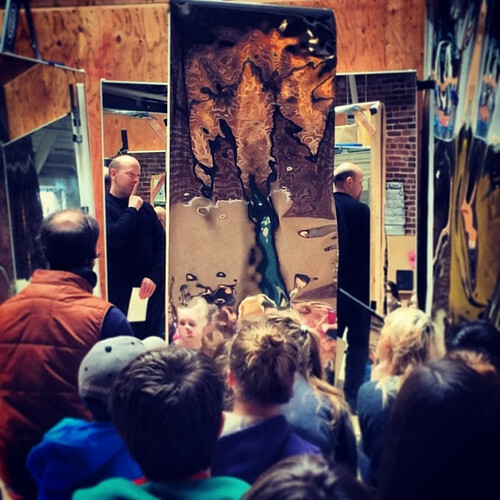 As the days lengthened and winter turns to spring, we celebrated the return of the sun and delved into the many meanings and uses of MIRRORS and the role that the reflective surface has played throughout history. The water in the dog bowl catches the morning sun and lights up the ceiling of the kitchen. The reflected light amplifies the tiniest ripples on the water’s surface, making visible the minute vibrations in the floor and faint gusts of wind moving in the room – photons traveling in straight lines. From Narcissus to Snow White and Through the Looking Glass, from reflection (and its many meanings) through symmetry and illusion to infinity – we came to know this thing that we call light in a new way. 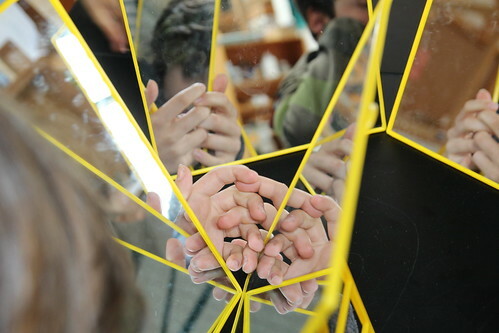 Students played with the mirror’s reflective properties and learned how to heat things like marshmallows up with light, studied symmetry in nature, and examined the mirror as a metaphor for looking inward to discover the self and reflect it through writing, art, film, and music.